The world may have known several big ice cream brands that can easily be found in many countries, but there are more that don’t get circulated as much but are actually very delicious. One of the countries that produce the best kind of ice cream is Russia. The history of its frozen dessert is quite long, started from the 30’s when the Soviet Union was still having control over the government. This is also the reason why Russian ice cream holds such a high quality and is so good. When the dessert was first produced in the Soviet Union, there were certain standards by the government that had to be met by the factories; one of them was the ingredients of the ice cream must all be pure and natural. The ratio of the fat was high and it made the ice cream soft and rich. After the Soviet Union collapsed, however, the strict standards haven’t been applied anymore. But this doesn’t mean the Russian ice cream is less tasty; it actually gives the industry a chance to invent more flavors and ship the products to a lot of countries. Three of the biggest ice cream companies in Russia are Iceberry, Petroholod, and Icecro. In this article we will take a look at the 8 most popular ice cream brands from these companies. You might already be familiar with some of them. Let us see. This brand comes in so many flavors and options. The servings and packages of this brand still preserve the classic ones from the past; namely briket and lakomka. Filevskoye is among the best brands because it is always made with fresh milk and still holds the high percentage of fat. The selection of flavors is very mouthwatering, too. You can choose one of these: bubblegum, apple-pear, pistachio with cashew, maple syrup and walnut, creamy melon, sorbet mango, vanilla bourbon, cherry, tiramisu, marshmallow, creamy banana, mint with chocolate, lemon lime, yogurt aroma and more. The classic vanilla, chocolate, and berries are always available. Compared to Filevskoye, Vologda has fewer options both in serving and flavors. But, this brand is among the top notch ones because of the unique tastes like northern berry, lingonberry, or hazelnut in boiled condensed milk. Vologda ice creams don’t come only in packages, but the tray versions can also be found in cafes and restaurants. This one is only sold in one package; a 450g pack in seven different flavors. You can choose one of these: bird’s milk, pistachio with pieces of nuts, walnut, caramel, tiramisu, cheesecake, or Austrian dessert. Vkuslandiya is ideal for family dessert after lunch or dinner or to be served on parties at home. This brand is the most popular one among Russian kids. Iceberry even specifically produce Father Frost with ingredients and formula that suit the children’s taste and need. The packaging and servings are also made with kids in mind. 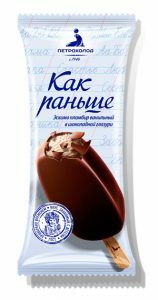 The original version of this ice cream, if you look at the wrappers, say Ded Moroz which means “Santa Claus” in Russian. Father Frost puts the ice cream in waffle cup, waffle glass, on a stick, between waffles in a briket, horn, plastic glass, and as a sausage. The flavors are quite basic like vanilla, chocolate, strawberry, pistachio, melon, crème brulee, and soft caramel. This brand can easily be found all over Russia, especially in Moscow. Petroholod is an ice cream located in Saint Petersbug, Russia. It is one of the biggest and the best because it still makes ice cream the “old-way”. Petrohold has an old ice cream machine that they use to process high quality ingredients and make very rich and delicious frozen desserts. Kak Ranshe is one of the most popular brands. The words themselves mean “like before” or, if loosely interpreted, could mean “the flavor that brings nostalgia and fond memories of the past”. Kak Ranshe restores the recipes and flavors that were used in the Soviet era like vanilla, vanilla with raisin, fruits, chocolate, and caramel. This brand only has two servings; in a waffle cup and on a stick. Despite the minimalism, Kak Ranshe is everyone’s favorite and one of the most sought ice cream brands in Russia. Similar to Vkuslandiya, this brand only comes in a box of 500gr in two flavors; blackcurrant sherbet with blackcurrant filling and ice cream with pieces of banana and strawberry. Definitely a family favorite and ideal to be brought home, shared, and enjoyed together. This brand is purposely sold for big occasions; therefore it comes in big buckets. Credo is also a healthy choice of ice cream because it doesn’t use any colorings or additives. It is said to be a lux brand and offers two flavors: strawberry with pieces of strawberry and pure vanilla. The choice of basic flavors makes Credo perfect to be combined with other desserts or drinks. This company produces both sorbet and ice cream with classic flavors. Almost like Petrohold, Icecro also tries to preserve the Soviet Union dessert recipe and keep the quality. All of Icecro ice creams come in buckets, so people can bring them home and scoop them into any servings they like. There are classic flavors, crunchy, and vegan. The unique flavors they have include rosemary vanilla, gingerbread, banana cinnamon, and sea buckthorn. The vegan choices include no sugar in the ingredients. Those were the 8 most popular ice cream brands from Russia. Which one would you like to try? All definitely sound so delicious and inviting. Maybe one day these brands will make their ways to your country so that you can try them. Or, even better, you may have a chance to taste them all when you make your trip to Russia. That will make them taste sevenfold better!